Gorillas live in Central Africa. There are two main species of gorilla, the Eastern Gorilla and the Western Gorilla. The Western Gorilla lives in Western Africa in countries such as Cameroon, the Congo, the Central African Republic, and Gabon. The Eastern Gorilla lives in Eastern African countries such as Uganda and Rwanda. Gorillas live in a range of habitats from swamps to forests. There are lowland gorillas which live in bamboo forests, swamps and lowland forests. There are also mountain gorillas which live in forests in the mountains. 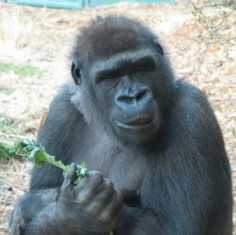 Gorillas are mostly herbivores and eat plants. The plants they eat include leaves, stems pith, fruit, and bamboo. Sometimes they will eat insects, especially ants. A full grown adult male will eat around 50 pounds of food in a day. Gorillas are the largest species of primates. The males are often twice as big as the females. The males grow to around 5 ½ feet tall and weigh around 400 pounds. The females grow to 4 ½ feet tall and weigh around 200 pounds. Gorillas have long arms, even longer than their legs! They use their long arms to "knuckle-walk". This is where they use the knuckles on their hands to walk on all fours. They are mostly covered with brown hair. Gorillas from different areas may have different colored hair. For example, the western gorilla has the lightest hair and the mountain gorilla has the darkest. The western lowland gorilla can also have grayish hair and red colored forehead. When male gorillas get older their hair turns white on their back. These older males are called Silverback gorillas. Yes, gorillas are endangered. Recently the Ebola Virus killed a number of them. This disease, coupled with people hunting gorillas, has put both species further in danger of extinction. Gorillas have hands and feet like humans including opposable thumbs and big toes. Some gorillas in captivity have learned to use sign language to communicate with humans. Gorillas live in small groups called troops or bands. 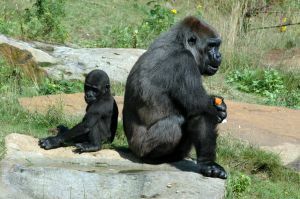 In each troop there is one dominant male Silverback, some female gorillas, and their offspring. Gorillas live around 35 years. They can live longer, up to 50 years, in captivity. They sleep at night in nests. Baby gorillas will stay in their mother's nests until they are around 2 ½ years old. 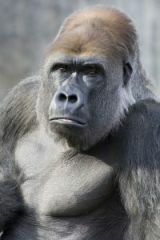 Gorillas are generally calm and passive animals, however, the Silverback will defend his troop if he feels threatened. They are highly intelligent and have now been observed using tools in the wild.